I have received a number of sketches, allegedly by Enrico Fumia, from the widow of a deceased Italian friend of mine who was a regular contributor to my Alfa Romeo archives. The sketches show that Fumia, who was part of the Pininfarina design team, submitted many proposals prior to his final design ideas for the Alfa Romeo 164. The whole business of designing for Alfa Romeo is a subject that arouses a great deal of passion among established Italian designers, and all the would-be’s in the broader Alfisti community. 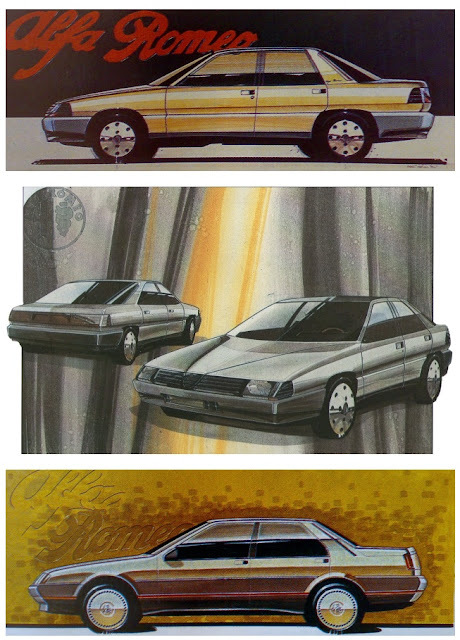 The ex-Pininfarina sketches reveal early thoughts, and then some more finished designs. 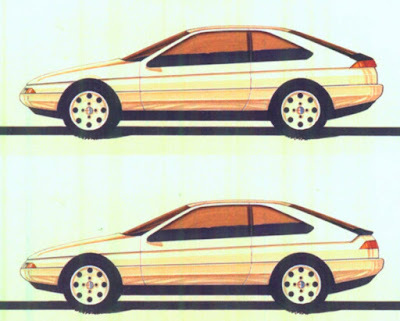 Ital Design, led by Giorgetto Giugiaro, who was responsible for design of three of the Type Four cars (Fiat Croma/Lancia Thema/Saab 9000), also submitted design ideas for the soon-to-be 164 (right) – however, by that time FIAT had already decided that Enrico Fumia’s design would be the successful submission. 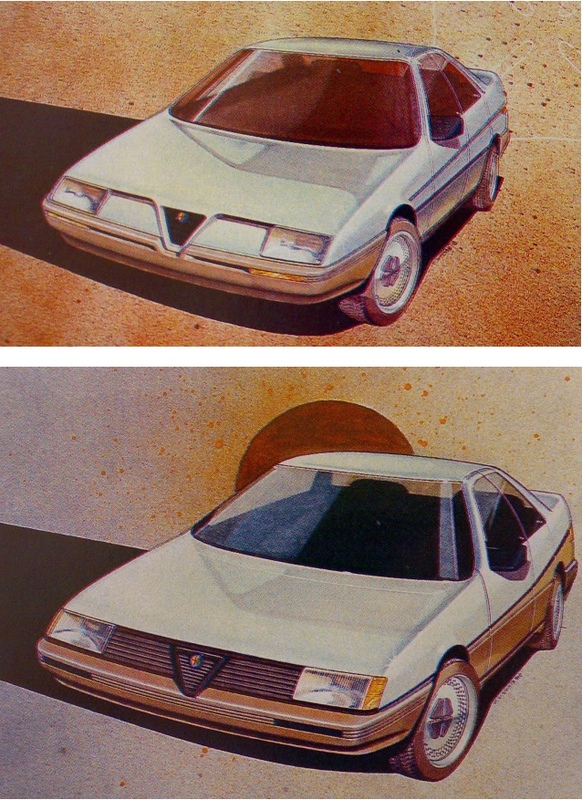 Ford Motor Company made a play for Alfa Romeo in 1986, and along with its highly conditional bid, submitted several design ideas from its Dearborn-based designers. The Ford bid failed, due to several reasons. First, the fact that it only wanted the car division of the Alfa Romeo conglomerate, and was vague about what it would do with the commercial vehicle, and the credit/financing divisions. The Italian government conglomerate Istituto per la Reconstruzione (IRI), which owned the whole of the Alfa Romeo business also wanted guarantees from Ford about employee numbers, but Ford of Europe’s President, Alex Trotman, would not be drawn, and said the offer was final. It was believed to be about USD$2.5 billion. FIAT’s eventual takeover bid was thought to be about USD$5.8 billion, and was all-encompassing. In addition both the FIAT and Alfa Romeo executives were apparently disgusted by Ford’s pedestrian design submissions, saying at the time that it was clear that future Alfa Romeo’s would probably ‘be based on Ford Cortinas’. That alone would be enough to ensure that IRI would choose FIAT over Ford. Ford's Italian studio, Ghia, was never consulted on the bid. It is easy to believe the 'Alfisti' think certain tragedy was averted in 1986 by FIAT’s victory. Although it took until 2007 before the world saw the 8C Competizione, the 4C (2013) and recently the Giulia. All passionately driven by one man - FCA’s Chairman and CEO, Sergio Marchionne. Driving life is a blog especially for car lovers. The Italian design cars are very popular. Ford was one time very popular. Now to people tend to prefer this car for its strong body and engine.